Cantilever table brackets provide the most comfort of all table bases. The cantilever table bracket or booth table bracket attaches a table to the wall allowing extra leg room. 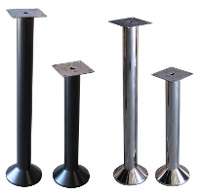 This style of table base is often used with a booth installation. We also carry a selection of cast iron table bases, floor mounted table bases, and outdoor table bases. Iron Table Base - 22"x30"
Iron Table Base - 30"x30"